Sound Transit waited almost two weeks to issue a rider alert and news release after The Seattle Times inquired about the slowdowns. The damage showed up in a 1,200-foot area, where the Link light-rail corridor crosses over I-5. 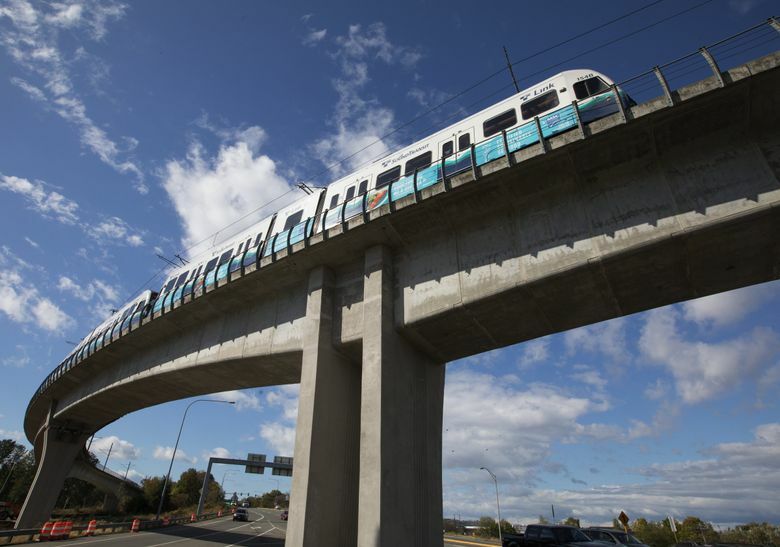 Sound Transit’s northbound trains have been abruptly braking to less than 10 mph as they enter Seattle near the south city limits, after cracks appeared in some of the 9-year-old rails. Train operators on Link have been under slow order since Sept. 20, when maintenance personnel discovered the cracks during a routine inspection, said transit spokeswoman Kimberly Reason. The damage showed up in a 1,200-foot area, where the Link light-rail corridor crosses over Interstate 5. The agency waited almost two weeks to issue a rider alert and news release midday Tuesday, after The Seattle Times inquired about the slowdowns. The lag in communications occurred because this was a developing situation, said Reason. Problems were being diagnosed, a repair plan wasn’t developed and bus detours were being discussed. A 5-mile segment between Rainier Beach Station and Tukwila International Boulevard Station will be shut down on Saturday for track repairs. Transit passengers can change to either a Metro Route 97 bus between those two stations, or choose an ST Express Bus between Rainier Beach Station and the Sea-Tac/Airport Station, along International Boulevard South at South 176th Street. On Friday after 9 p.m. and all day Sunday, trains will alternate on a single track in that area. The Sunday single-tracking will cause minor delays, and 10-mph travel both directions, which will affect some fans attending the Seahawks football game in Sodo. Inspections continue along tracks between Seattle and SeaTac, but the area near the city limits “called for immediate repairs,” Reason said. Southbound trains continue to go a normal speed, officially rated at 40 mph, where the trackway bends from Martin Luther King Jr. Way South and continues over I-5 and a freight-rail yard into Tukwila. But northbound, train operators are slowing to somewhere between a walk and a jog. A three-car train weighs about 450,000 pounds, not counting passengers. Slow orders are imposed along passenger-rail lines to cope with a variety of unsafe or unorthodox conditions. Sound Transit turned down a request to interview operations managers about technical issues Tuesday, saying they need to learn more facts first. “This analysis is going to be ongoing. Clearly this does not meet our expectations,” Reason said. Cracking is confirmed only within the immediate 1,200-foot area of the I-5 overpass. Sound Transit is investigating why the cracks occurred, and why they’re only showing up northbound. Dave Aarhus, who works at Harrington Industrial Plastics next to the trains, says he started seeing trains come to a near stop last month on every northbound trip. Among other effects, the southbound trains screech but the slower northbound trains don’t, he said. The slowdowns have not dramatically altered commute times. Aboard the trains Monday afternoon, a 2-mile southbound ride from Rainier Beach Station to the Duwamish River bridge took 3 minutes, 13 seconds — compared to a 4:28 ride the other direction, for a delay of at least 1 minute per trip. A second trip took 5:18, which also included a brief stop for a red road-traffic light on Martin Luther King Jr. Way South. Sound Transit CEO Peter Rogoff referred to the track damage at a transit board meeting on Thursday. “We will continue to be vigilant and will step up our inspections to make sure this defective rail is a one-off occurrence,” he told the board. Inspections to date show small cracks on the knob-shaped rail heads, Reason said. Sound Transit will perform a “root-cause investigation” to be shared with the agency’s governing board and the public. One possibility may be what a British-led study calls “rail contact fatigue,” which caused several slowdowns and closures there in the early 2000s. Curved tracks have a tendency to crack when stiff wheels repeatedly scrape the inside of the railknobs, the study found. Problems can be solved by grinding the rail pairs to change where the wheels contact each rail; increased lubrication that sets a thin film between steel wheels and rails; or reducing the stiffness of the axle suspension clusters, also nicknamed bogies, beneath the trains. The Transportation Technology Center in Pueblo, Colorado, a leading industry lab serving Sound Transit and other rail operators, declined to speculate Tuesday about possible causes for Seattle rail damage. Transit rails on the East Coast have cracked or pulled apart during extreme change in temperatures, but Seattle recently coasted through a pair of mild, wet winters. 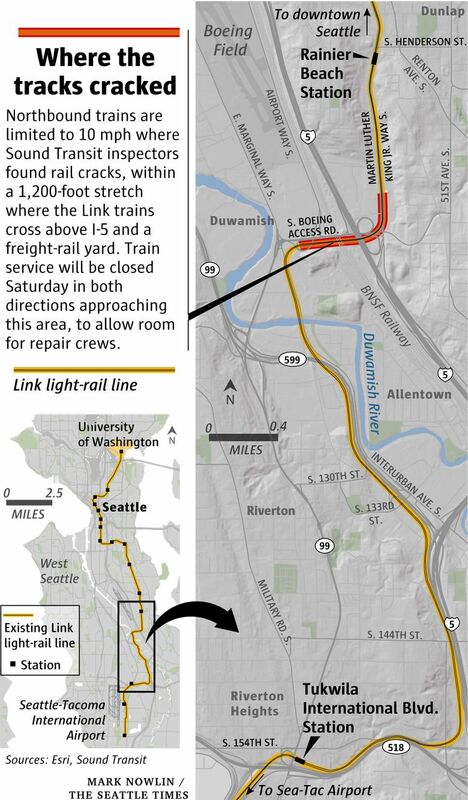 Link light-rail trains have navigated the I-5 and Duwamish curves trouble-free since the opening in July 2009, except that train wheels squealed loud enough to prevent conversation near the river. Sound Transit eventually fixed that using rail grinding, noise-deflecting barriers and automated track-lubrication dispensers. This weekend’s delays will tarnish Link’s on-time performance rate of 93.9 percent for the first seven months of 2018, ahead of the official 90 percent goal. The trains carry an average 261 people per run between Angle Lake Station in SeaTac and University of Washington Station in Seattle, and averaged 81,870 weekday passengers as of July.